JFC has supplied farmers with high quality water troughs since 1987. We understand the importance of providing livestock with fresh, clean and easy accessible drinking water. Through consultation with agricultural specialists and listening to the needs of farmers we have developed a range of water troughs suitable for all applications. 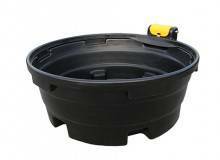 The 180 gallon (871L) premium water trough has JFC’s signature shiny black colour with a yellow, easy-to-access service lid. The trough is fitted with a JFC fast-fill float valve which comes with a 3/4 inch connection and is capable of delivering up to 95L/min (3 bar pressure). The 250 gallon (1125L) premium water trough has JFC’s signature shiny black colour with a yellow, easy-to-access service lid. The trough is fitted with a JFC fast-fill float valve which comes with a 3/4 inch connection and is capable of delivering up to 95L/min (3 bar pressure). The 350 gallon (1590L) premium water trough has JFC’s signature shiny black colour with a yellow, easy-to-access service lid. The trough is fitted with a JFC fast-fill float valve which comes with a 3/4 inch connection and is capable of delivering up to 95L/min (3 bar pressure).